Since its introduction more than a decade ago, the Toyota Tacoma has been a mainstay of the compact-pickup segment. Typical advantages to a new or used Tacoma include a variety of body styles to choose from, useful off-road abilities, solid build quality and a better-than-average reputation for reliability and durability. Downsides are few. Even when modestly appointed, Toyota's compact pickup usually costs more than competing trucks from domestic manufacturers, and taller drivers might find the cabin of the first-generation Tacoma to be somewhat uncomfortable. 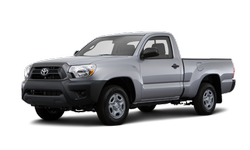 But overall, the Toyota Tacoma is a very capable pickup and comes recommended for nearly all truck shoppers.. Here you can find Toyota Tacoma owners and service manuals and other information of car.